Work placement for your students? Support in teaching your students about the growing, modern, state-of-the-art material, products and process involved in aluminum extrusion? Broadens the scope of the education that your students receive. Provides knowledge of a modern and growing material opportunity more aligned with current and future material and design needs. Provides a tighter connection between your school, the industry and specific companies that could enhance/expand learning opportunities and interactions such as plant tours, guest lecturing--either ad hoc or as part of a specific curriculum. Promotes a closer working relationship with a large and vital industry providing opportunities for students to gain practical industry knowledge through student and co-op placements. Here’s a sample of how one AEC member has developed their academic program with the local high school. Strong support from the industry to help educators “learn and teach” about aluminum and aluminum extrusions. This includes the yearly ET Foundation Aluminum Extrusion Design Competition, which can help cement learning through practical design application. Learn more here. Facilitating the connection between your school and appropriate AEC members that match your geographical and educational preferences. Conducting the yearly student Aluminum Extrusion Design Competition with winning entries receiving thousands of dollars in scholarship awards. Providing industry instructors and learning tools/materials on aluminum and aluminum extrusions, the process, products and design opportunities. Providing a “train-the-trainer” program for those educators who are less familiar with aluminum and aluminum extrusions that could include specific webinars, collateral material and plant tours. 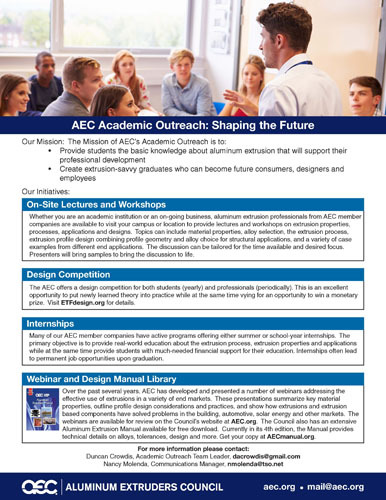 Download the AEC Academic Outreach flyer to learn more. 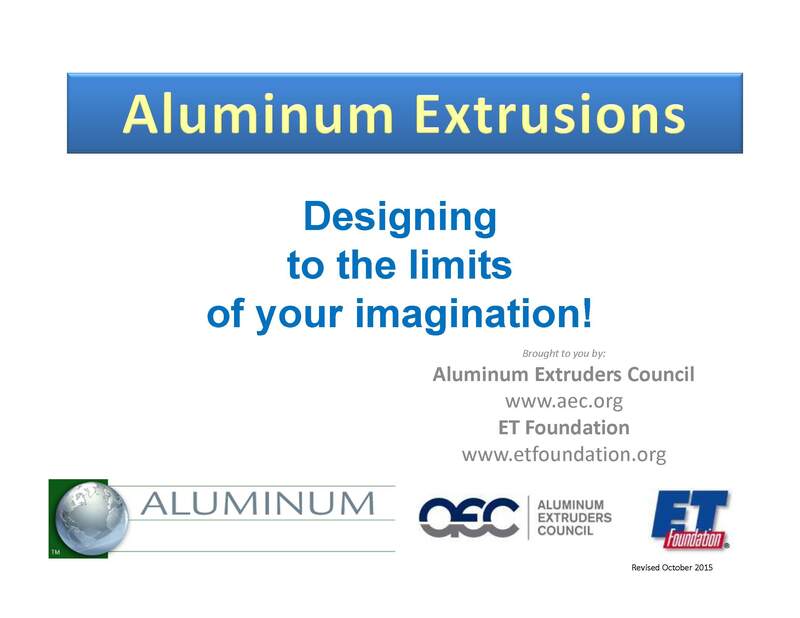 Download the educational presentation, “Designing to the Limits of Your Imagination”, to learn more about aluminum extrusion applications, design and processes. Download your free copy at AECmanual.org. Contact AEC for more information on how you can incorporate aluminum extrusion into your curriculum through volunteer industry instructors, plant tours, webinars, and more.